• Holds 12 1"H Trays - Included in this listing. plastic Trays Dimensions: 14 3/4"L x 8 1/4"W x 1"D Case Dimensions 16 3/"L x 9 3/8"W x 13 1/2"H Locking w/ Keys and Combo lock Mesh Velcro closure pocket on inside of door Use our sturdy, lightweight 12 Tray Aluminum Rolling Jewelry Case With Handle to carry jewelry trays. Features include an adjustable pull-out handle, and side opening doors for easy access to contents inside. 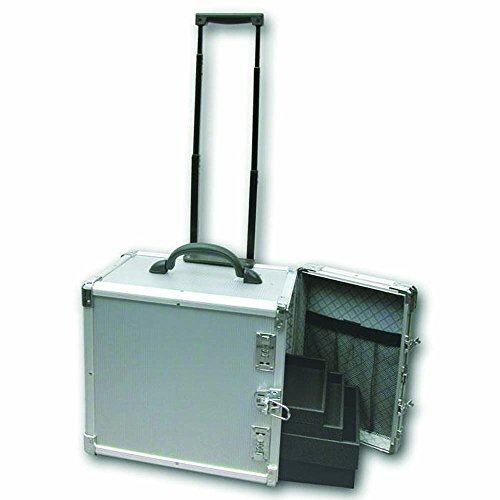 This lightweight case is designed to hold 12 1" trays inside of the storage area. Trays included - Inserts are SOLD SEPARATELY. If you have any questions about this product by bestjewelrysupply, contact us by completing and submitting the form below. If you are looking for a specif part number, please include it with your message.